By moving these services into a controlled, single source environment, AGS can provide a facility with a premium quality central plant system in a matter of months rather than the years it may take to engineer and construct a field built system integrated into the building. Prefabricated central plant systems are ultimately less expensive than field built systems but the most important financial aspect of this approach is the speed with which we can deliver these projects to get cultivation facilities running and producing revenue. 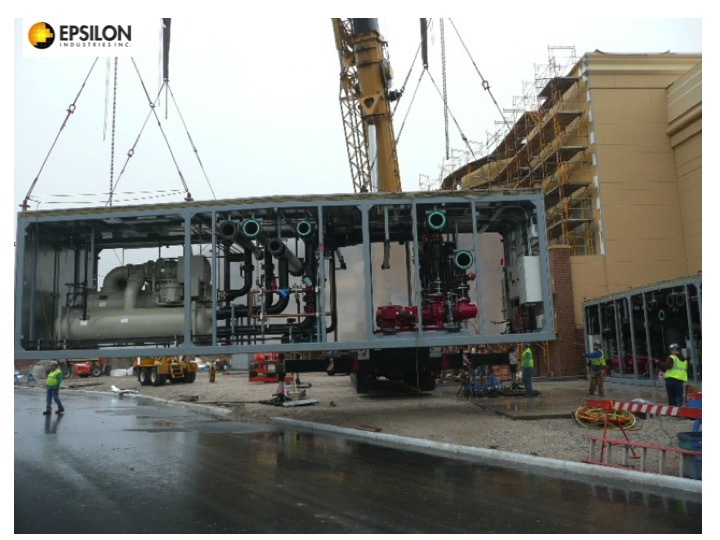 refabricated plants are delivered in shipping sized modules for re-attachment on the job site. Prefabricated plants are fully wired and assembled in a factory setting for a clean and compact finished product. Fabrication of central plants can run concurrent to building construction. Cogeneration through combined heat and power (CHP) is the simultaneous production of electricity with the recovery and utilisation heat. Cogeneration is a highly efficient form of energy conversion and it can achieve primary energy savings of approximately 40% by compared to the separate purchase of electricity from the national electricity grid and a gas boiler for onsite heating. The waste heat from these systems can also be used to create free chilled water via an absorption chiller. These systems are truly ideal for cannabis cultivation because cannabis cultivation requires a massive and constant electricity load which requires a proportionate amount of cooling and heating to properly maintain environment. Generally these systems are fueled using either natural gas or biofuels which produce large amounts of carbon dioxide as a byproduct of combustion. This CO2 is also extremely valuable to cultivators. A 700kw CHP system can save a facility upwards of one million dollars in yearly operating costs. AGS can deliver these systems as a prefabricated turn key central plant as described above. We work with a number of CHP manufacturers and industry specific financing companies to help owner's attain the absolute pinnacle of efficient, environmentally sustainable facility energy operations.